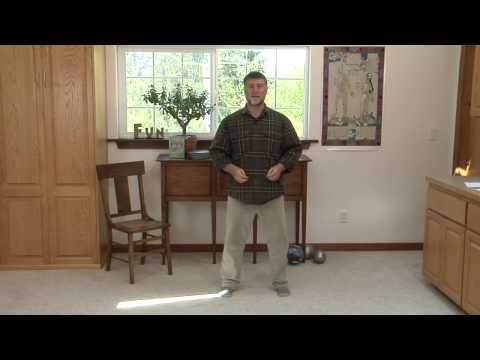 I learned this set from my Medical Qigong teacher Dr. Jerry Alan Johnson. He credits Dr. Her Yue Wong with introducing it into the USA in the 1970’s. Dr. Johnson told me that he gave these exercises to more people than any other healing prescription. He often found that very sick people were holding so much armor that they were unable to relax enough to let healing enter and spread through their bodies. So he taught them the Old Man to release their holding, usually to impressive results. Following a sophisticated understanding of the Five Elemental Energies system, the Old Man Set opens blockages in the body so stuck fluids, Qi, and blood can flow again, resulting in healing. By upgrading from stagnant swamp internally to flowing rivers and rivulets, health naturally re-establishes. Since 2000, I have taught this exercise to many clients. Over and over again they have come back to me with glowing reports of how well it has helped them manage or delete unhealthy amounts of blocking, sludgifying emotions, feelings, and sensations. I’ve truncated the name of the encompassing term of the video to depression, but the Old Man exercise is great for helping with many emotional weights, including: sadness, grief, impatience, judgementalism, anxiety, worry, low energy, unprocessed emotions, indecisiveness, lack of clarity, anger, grumpiness, and rage. Below is the Overview Video of the Old Man. In the next post I’ll add the video detailing the Lungs and sadness tomorrow; and videos 3, 4 and 5 over the next week or two. So glad to have found these on the web. Keep it up! I life in Ohio and have not been able to find a real, live qigong teacher, so these are much appreciated.